Outstanding questions and research opportunities in extracellular RNA biology. Advancing research on extracellular RNA (exRNA) communication holds great potential for transforming translational science. The NIH Strategic Workshop on Extracellular RNA Transport identified many unanswered fundamental questions and unmet technical challenges and generated recommendations on high priority areas that could catalyze research across the exRNA field. (1) RNA sorting and loading. What are the RNA structural features and RNA-binding proteins (RBPs) that guide RNA to different extracellular vesicle (EV) subtypes, i.e., exosomes and microvesicles? (2) EV biogenesis and heterogeneity. 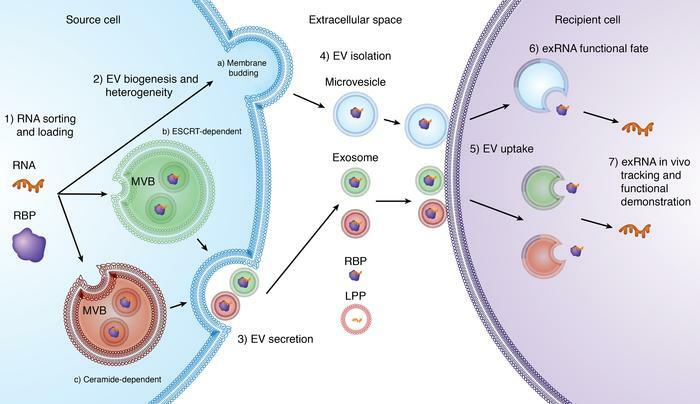 What are the molecules and molecular machineries specific to individual EV biogenesis pathways, i.e., (a) direct membrane budding of microvesicles; (b) endosomal sorting complexes required for transport–dependent (ESCRT-dependent) or (c) ceramide-dependent multivesicular body (MVB) formation? How do different biogenesis pathways contribute to EV heterogeneity? (3) EV secretion. What are the molecular determinants that direct the secretion of EV subtypes along different export pathways? (4) EV isolation. What are the unique biophysical/biochemical characteristics of each EV subtype that could be used for functionally separating EV subtypes from each other and from other exRNA carriers, i.e., RBP, lipoprotein (LPP)? (5) EV uptake. What are molecular interactions between EVs and recipient cells that determine targeted delivery of exRNAs? (6) exRNA functional fate in recipient cells. How are exRNAs processed and through what forms do exRNAs execute their effector functions in recipient cells? (7) exRNA tracking and functional effect in vivo. What are the model systems that allow targeted modification and disruption of EVs to enable monitoring exRNA dynamics in vivo and unambiguous demonstration of their physiological relevance? Illustrated by Rachel Davidowitz.